Anthony suggested his daughter drugged Caylee Anthony on June 16, 2008, possibly with Xanax she got through friends. He also suggested it wasn't the first time Casey may have done this, noting Caylee often slept for up to 13 hours at a time, per USA Today. "I believe that Casey gave [Caylee] something," George Anthony said. "Caylee didn't wake up." When asked what the street name of Xanax is, George replied, "Zanny." Some sites are reading into the remark. His wife, Cindy, tells Investigation Discovery she believes Caylee's death was indeed an accidental drowning and that Casey simply panicked. 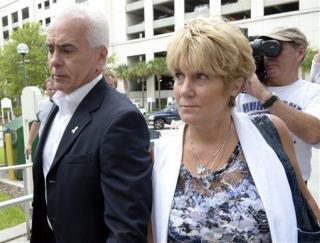 She says she's since forgiven Casey and still speaks to her occasionally, reports the Orlando Sentinel. George, however, said he'll likely never speak to his daughter again, and adds, "Justice would be to have my daughter behind bars and have her suffer the way Caylee suffered." How does the couple stay together with such diverging opinions? "I don't think I could find anybody else that would understand my day-to-day ups and downs and what we go through other than him," says Cindy, per USA Today. Deadline suggests the series has been a big win for Investigation Discovery, the network owned by Discovery Communications. Sunday’s premiere pulled in 2.9 million live, same-day viewers, making it the network's biggest series debut. The format in general is turning out to be a success. The Washington Post notes JonBenet: An American Murder Mystery took Investigation Discovery's top slot among its 2016 event series. What do the critics think? Hal Boedeker was mostly favorable in the Sentinel, writing, "I’m usually no fan of re-enactments, but the program used them effectively, photographing stand-ins from a distance and never showing faces." There was a real "you are there" feeling to it. Anyone who has ever pled guilty to a crime because they had overwhelming evidence against them has got to be kicking themselves right now. If ever you find yourself in that situation, you've got to go ahead with the trial, make up anything, no matter how nonsensical it sounds, and hope you get a dumb jury, like Casey Anthony did. The look on Cindy's face when the verdict was read told me everything about Cindy. She knew her daughter was guilty, she lied on the stand and didn't care. They had won! That was the only thing she cared about. Caylee was gone and wouldn't be back but they had won. Casey is an evil, horrible person and we don't need to go far to see where she learned it. Cuplpable Both POS Grandparents This Wretched Monster Lives to create another life she will probably kill Wheres God again?